The One and I have been making and enjoying this dish for years—in fact, it’s been in our arsenal for about a decade. Technically, it’s not a chili, as it doesn’t contain chiles or chili powder. It’s really more of a Mediterranean bean stew. But what can I say, nicknames stick. What’s great about it is it’s a cinch to make—it takes all of a half hour—and it’s surprisingly light. When we have weekend guests and don’t want to get bogged down with making six big, heavy meals, we turn to this for a satisfying lunch or a light supper with a salad on the side. 1. Heat a large skillet over medium-high heat until hot. Swirl 2 tablespoons of the oil into the pan and then add the turkey. Cook, stirring often and breaking up the meat with the edge of a wooden spoon, until the turkey is chunky and nicely browned, about 10 minutes. 2. Drizzle the remaining tablespoon of olive oil over the turkey. Dump in the onion and pepper, sprinkle with the oregano, basil, and thyme, and sauté, stirring often, until the vegetables are just softened, about 7 minutes. Add the garlic and cook 2 minutes more. The bottom of the pan may develop a brown coating—that’s good. It gives a lot of flavor. If it threatens to burn, drizzle in a few tablespoons of water and scrape it up. 3. Turn the heat to low and stir in the beans and half of the tomatoes and half their liquid. (Reserve the remaining tomatoes and liquid for a meal stretcher, see Note.) Season with salt and pepper to taste, cover, and simmer for 15 minutes. Unexpected company? No problem. Add a second can of drained cannellini beans and the remaining chopped tomatoes and their liquid. Simmer the chili until heated through. Serves six, easily. 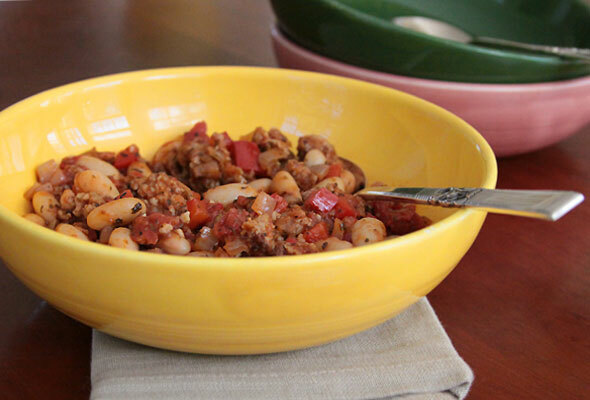 Turkey and White Bean Chili Recipe © David Leite. All rights reserved. All recipes and photos used with permission of the publisher.